Very good inexpensive property for my quick stay. The room was clean and redone. I could have my dog there with no problem. I like the rooms redone with a laminate floor instead of carpet. The staff was very hospitable and welcoming. The restaurant was excellent. The hotel has a lot of charm. It is the best destination in the area. Where to find Winchester hotels near an airport? Where can I find hotels in Winchester that are near tourist attractions? If you are seeking quality lodgings in Winchester, you'll find options aplenty! If you would like to stay within 0.1 kilometres (0.06 miles) of downtown Winchester, Expedia's hotel database lists at least 21 accommodation options that meet that criteria. If you would like a great place within a half mile of the heart of Winchester, check out the latest deals at the popular The George Washington Hotel, A Wyndham Grand Hotel. Stephens City is an area that is 12 kilometres (7 miles) from the middle of Winchester and offers the largest selection of Winchester Expedia-listed accommodation options. 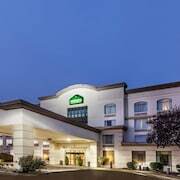 Stephens City hotels include the Holiday Inn Express Winchester South-Stephens City and Comfort Inn Stephens City. Front Royal which is 30 kilometres (18 miles) away is where you'll find Hampton Inn Front Royal and Holiday Inn & Suites Front Royal Blue Ridge Shadows. 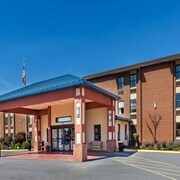 Strasburg, roughly 25 kilometres (17 miles) from the heart of Winchester is home to Fairfield Inn & Suites Strasburg Shenandoah Valley and Hotel Strasburg. Winchester features a solid selection of affordable accommodation options sure to delight budget-minded travelers. 12 kilometres (8 miles) away from Winchester's heart is where you'll find the Comfort Inn Stephens City. The Ramada Strasburg Va is only 25 kilometres (16 miles) away. Two other options in the cheaper range of Winchester accommodations are the Quality Inn Skyline Dr and the Super 8 Front Royal. 20 kilometres (13 miles) from downtown Winchester, is the Hillbrook Inn. 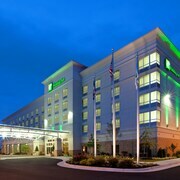 The Hampton Inn - Winchester N/Convention Center is 2 kilometres (1 mile) away. 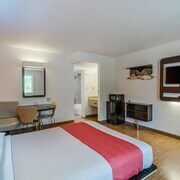 You could also book the Hilton Garden Inn Winchester or the Holiday Inn Winchester Se-Historic Gateway. For those inspired to see some more of the valleys that are a big feature in this area, you might also book a few nights in other destinations in Shenandoah Valley. Whether you join in with the popular activities, such as hiking and caving, or travel around to explore the area's offerings you will be able to book comfortable hotel accommodation in the vicinity. Woodstock is 45 kilometres (28 miles) to the southwest of Winchester and is where you'll find Woodstock Museum and Shenandoah County Fairgrounds. Should you wish to stay in Woodstock, check out the room rates at the Hampton Inn & Suites Woodstock and Holiday Inn Express Woodstock-Shenandoah Valley. Alternatively, you could consider staying at New Market, 75 kilometres (46 miles) to the southwest of Winchester, where you'll find the Quality Inn Shenandoah Valley and Days Inn New Market Battlefield. The Endless Caverns and New Market Battlefield are just some of the more popular points of interest to experience in New Market. Washington Dulles International Airport is a logical airport, and can be found 65 kilometres (42 miles) from Winchester. 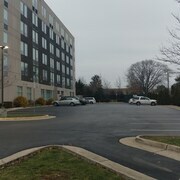 Expedia-listed hotels close to Washington Dulles International Airport are Embassy Suites Dulles Airport and Washington Dulles Airport Marriott. What are the most popular Winchester hotels? Are there hotels in other cities near Winchester? What other types of accommodations are available in Winchester? Explore Winchester with Expedia.ca’s Travel Guides to find the best flights, cars, holiday packages and more!